Remember reading predictions for the future in science magazines? Or watching The Jetsons? 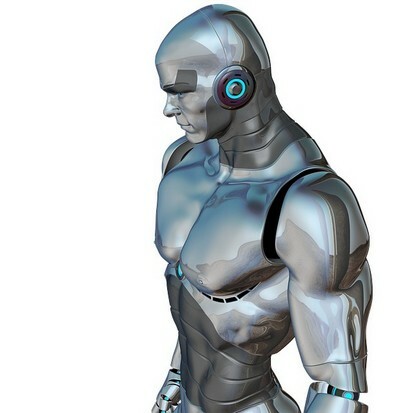 Robots were going to make dinner, take out the trash and clean the house. The Roomba is the closest we’ve gotten and I’m sorry, but the Roomba is no Rosie. Even though we don’t have robots at our beck and call, we do have the ability to automate tasks. One of the things I love most about writing computer programs is that my computer works for me. Computers are incredibly reliable workers. They don’t eat or sleep and they don’t complain about doing the same thing over and over again. Instead, they thrive on repetitive tasks and can do them faster and with less error than any human. Autoresponders don’t do anything you couldn’t do yourself. But they do it without making you lift a finger. Autoresponders are the business equivalent of having Rosie humming about doing your laundry, cooking and cleaning. Plainly stated, autoresponders are emails that are automatically delivered on a schedule. For instance, you can set up a welcome email to go out the day after a user subscribes. Then you can set up another to go out three days later and another one a week later. Autoresponders can be turned into email courses. You can create an autoresponder that sends out an email a week for six weeks and you’ve got yourself a six week course. The reason to use autoresponders is two-fold. First, it gives you a way to stay in touch with new subscribers, introducing them to your business and what you have to offer to them. It’s too overwhelming for a new subscriber to dump everything on them at once. Instead, trickle the information out slowly to let the information sink in. Second, you have better things to do than sending out email. You probably have too much email already and I can’t imagine you’re looking for more tasks to add to your to-do list. When given the chance to offload a task, jump at it. Autoresponders are an ideal way to offload the task of onboarding new clients and letting them know how you can help them. Autoresponders are available on all major email marketing services, including Mailchimp, but with a caveat. 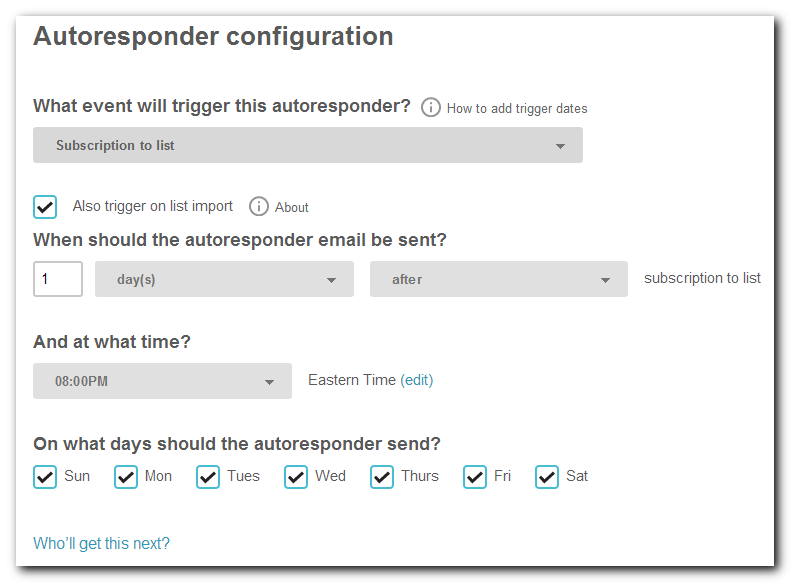 Free Mailchimp accounts don’t let you create autoresponders. They used to, so if you happened to create your Mailchimp account sometime in 2011, you might have the feature grandfathered in. If not, you can bump up to the $10/month service to create autoresponders. Click the Autoresponders block on the left sidebar. Click the Create Autoresponder button, then select the list to send the emails to and whether to send to the entire list or just a portion (they call it a segment). Note: This may be different when you don’t have any autoresponders, but on my paid account I’m not about to delete my autoresponders to see, and the free account I created to get screenshots for An Introduction to Mailchimp won’t let me create autoresponders. This is the meat of the autoresponder. You choose the trigger, the date and time to send the email, on what days to send on, and you can see who in your list will be getting the autoresponder next. The trigger is the event that needs to occur for a user to get an email. Subscription to a list is the simplest one. When a user subscribes to the list, they get the autoresponder emails. You also have the option to automatically send an email if someone makes a purchase. This could be a thank you for purchasing, or you could send them an unexpected bonus (users love those). Or you could send them an email with more information about their purchase. Other options include sending an email when a user clicks on a link in your campaign or when you open a new campaign. This lets you target users who are actively engaging with your content without bother users who aren’t interested in a particular campaign. And finally, you can send out an email if they change their information or if they browse to a particular web address. Get creative with these triggers. You can do some really cool things with autoresponders to help your clients, and the great thing about it is you set it up once, and then it will keep on working for years to come. The last part of an autoresponder is when to send it. This time will be relative to the trigger taking place and can be anything from within the hour, to days, weeks, months or even years after. Now that you know how autoresponders work and how they can help you engage with your users, use them! Set up three simple autoresponders that send emails one day, three days and a week after they subscribe. It helps your users get to know you better while you can sit on the beach sipping lemonade. The future is here my friends.